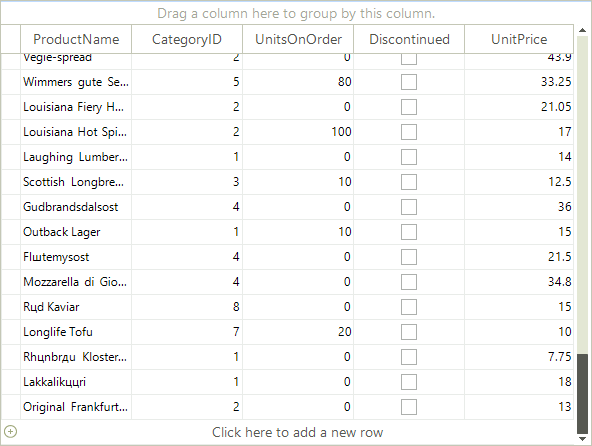 RadGridView provides the end-users with a special row that allows them to add a new data row. For brevity, we will call this row "new row". The following sections describe useful events and properties which will allow you to achieve different scenarios related to the new row. For the text displayed in the new row of RadGridView you have the option to set it directly to the corresponding template. 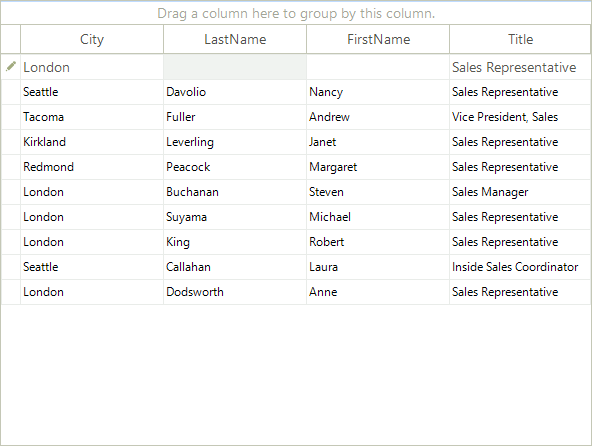 This allows you to have a different text on the new row of each level of your hierarchical grid. Me.RadGridView1.MasterTemplate.NewRowText = "Click here to add a new category"
Me.RadGridView1.MasterTemplate.Templates(0).NewRowText = "Click here to add a new product"
In case your RadGridView is data-bound, it will try to set the CurrentRow to the first data row after it is filled with data.Therefore, you have to set the CurrentRow to TableAddNewRow after you bind the grid (after the Fill call of the TableAdapter in case you are following the ADO.NET approach for data-binding). DefaultValuesNeeded is one of the events that you will probably use in your application. When you click the new row, the new row becomes current, the prompt text ("Click here to add a new row") is removed, and RadGridView enters its edit mode. This is the moment when the DefaultValuesNeeded event is fired. As the name of the event implies, it allows you to set the default values for the new row which, if unchanged by the end-user, are saved in the row when the new row is committed by the end-user. False: RadGridView creates a new record in the underlying data source only after the new row is committed (validated). This is the default behavior. True: RadGridView creates a new record in the underlying data source right after the end-user starts editing the new row. If the end-user presses Escape to cancel the editing operation of the new row and goes to another row, the newly created record is deleted. EnterMovesToLastAddedRow: When the end-user press the Enter key, the new row is committed and becomes are regular data row. After that RadGridView sets it as CurrentRow. EnterMovesToNextCell: When the end-user presses the Enter key, the next cell in the new row receives the focus and becomes the currently edited cell. If the end-user is at the last cell of the new row and he\she presses the Enter key, the new row is committed and RadGridView exits its edit mode. None: If RadGridView has an opened editor in the new row and the end-user presses the Enter key, the value that is in the editor is saved in the respective cell in the new row and RadGridView exists its edit mode. The current cell is not changed in this situation. RadGridView exposes several end-user events two of which you will find useful in the context of the new row: UserAddingRow and UserAddedRow. These events are fired when the user commits the new row (by pressing the Enter key or by clicking somewhere in the grid). As the name of the UserAddingRow implies, it allows for preventing the new row from being committed as a data row. This may be useful in case some of the data entered by the end-user is invalid according to some custom requirements. In the examples below we will demonstrate what you can do by using the UserAddingRow and UserAddedRow events.